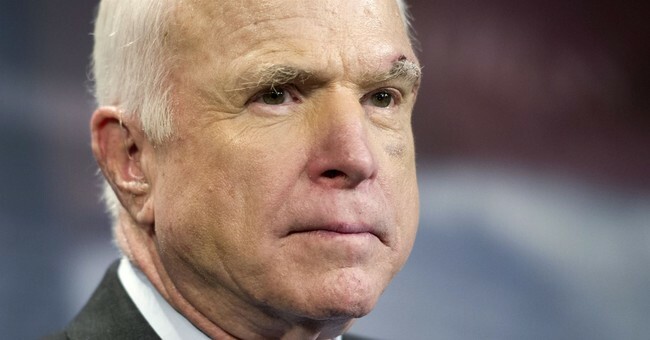 In light of the recently reported chemical attacks allegedly carried out by Bashar al-Assad, Arizona Senator John McCain lambasted President Donald Trump saying that Syria was “emboldened by US inaction” after the commander in chief indicated last week he was considering withdrawing troops from Syria. But, some could argue that Sen. John McCain is correct, and President Trump betrayed one of his defining foreign policy character traits. "President Trump last week signaled to the world that the United States would prematurely withdraw from Syria. Bashar Assad and his Russian and Iranian backers have heard him, and emboldened by American inaction, Assad has reportedly launched another chemical attack against innocent men, women and children, this time in Douma," Sen. McCain said in a statement. "Initial accounts show dozens of innocent civilians, including children, have been targeted by this vicious bombardment designed to burn and choke the human body and leave victims writhing in unspeakable pain," he aded. This statement came after a series of tweets this morning in which President Trump slammed President Vladimir Putin and Iran for supporting ‘Animal Assad’. To that extent, Sen. McCain called for action, not just tweets. "President Trump was quick to call out Assad today, along with the Russian and Iranian governments, on Twitter. The question now is whether he will do anything about it. The President responded decisively when Assad used chemical weapons last year. He should do so again, and demonstrate that Assad will pay a price for his war crimes," his statement said. The president's tweets also slammed former President Barack Obama for failing to take a strong stand after Syria used chemical weapons during his presidency. Sen. John McCain acknowledged this fact, but called for a "comprehensive strategy" with "clear objectives" in mind. “To be sure, President Trump inherited bad options after years of inaction by his predecessor in Syria. History will render a bitter judgment on America for that failure. But no one should believe we are out of options. We can and should change course – starting with a comprehensive strategy that lays out clear objectives for our mission there. It's not too late to stop Assad's impunity and begin to rewrite this terrible chapter in our history,” the Arizona senator added. With all that being said, one should point out that President Trump's announcement last week to withdraw troops strayed from his typical foreign policy governance. In President Trump's 2018 State of the Union, he told America that, when it comes to the war in Afghanistan, "our warriors in Afghanistan also have new rules of engagement. Along with their heroic Afghan partners, our military is no longer undermined by artificial timelines, and we no longer tell our enemies our plans." President Trump also made similar comments about ISIS on the campaign trail, often saying that he had a secret plan to defeat ISIS and refusing to say how exactly he would destroy them. By all accounts, President Trump obliterated ISIS off the face off the earth. It is unclear why he announced his desire to withdraw troops from Syria when he found success in other areas of the Middle East by keeping his military plans close to the vest.